Melorra, India’s first fashion trends inspired precious jewellery brand has launched its Lavender collection with 40 affordable pieces to choose from. Soft lavender is spotted as the color of the season on the runway. The popularity of lavender sits within a larger trend towards pastels in the spring summer categories and offers a fresh alternative to millennial pink. The new collection has wide array of designs under the concept ‘Stylized Flora’ which captures the natural bloom and flow of a flower highlighting the color lavender through enamel. 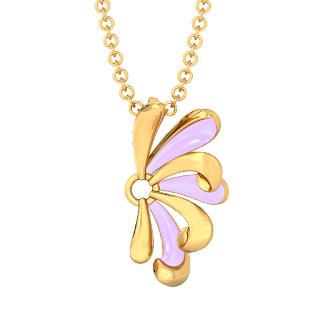 Crafted in high polish, matte finish, yellow gold, the jewellery highlights ‘Lavender enamel’ as its key feature. Why miss the color in precious jewellery, when you love it in bags, shoes and garments? “Though ultraviolet is the official pantone color of the year, its lighter counterpart ‘Lavender’ takes center stage in the fashion sphere this season. The soft purple color is romantic yet elegant. With the new ‘Lavender collection’, we aim to bring an essence from the macro-trend of nature through stylized flora, with the color lavender as the main focus.” said Deepshikha Gupta, Sr. VP Design at Melorra. Lilac Licious – a dimensional earring with an overlapping enamel glaze of lavender on a petal shaped chunky stud; is definitely a head turner. Subtle yet sharp, this piece has a captivating yet detail charm for elegance and sleek style. Pair this earring with any evening gowns and add a touch of chic! Wonder Lavender- a charming two chained bracelet with petals linking the chains. Each petal is unique in its creation. This bracelet is perfect to wear alongside any watch or as a happy single on the wrist to notch up the wrist fashion. Violet Vision – folded petals glazed with delicate enamel of lavender carefully created to be a beautiful ring perfect to embrace the fingers to give a floral accent. This ring will fit perfectly and is an easy to wear ornament with any outfit. Purple Curl- a half flower shaped pendent with flowing petals curled flawlessly is a must have in this collection. This pendent can be paired with various link chains to enhance its contemporary style. Add a touch of nature inspired beauty to any look by adorning this piece with a black classic gown. The collection presents a new range of casual wear yellow gold jewellery with enameled bracelets, pendants, necklets, rings, drop earrings with high polish and matte finish which blends the lavender color with floral designs.